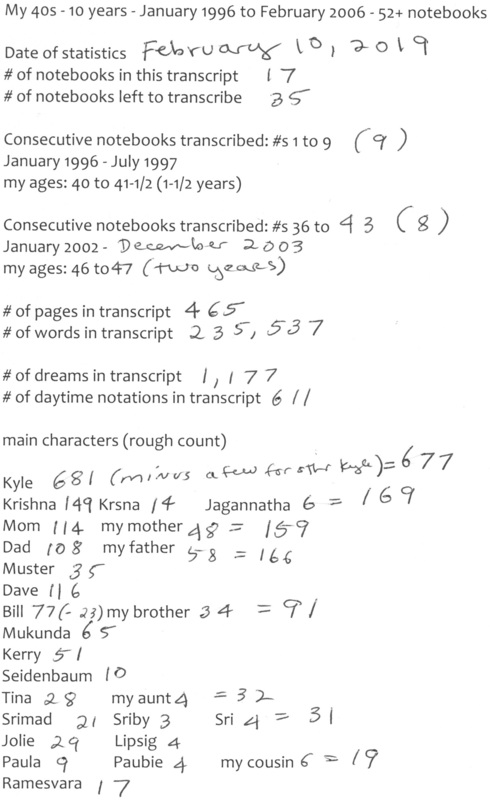 ﻿ Dream Sets for Content Analysis "My Forties"
Dream Sets for Content Analysis - "My Forties"
I began transcribing the notebooks the week after Thanksgiving 2018. Before New Years, I had transcribed the first nine notebooks, covering January 1996 to August 15, 1997. The transcript is approximately 100,000 words, covering approximately 250 pages. It includes 614 dreams and 385 daytime notations. I worked on it a few hours in the morning, four or five days a week.